Say chowder out loud: chowder. The word sounds like food. Not an appetizer either. An entree in a small crock topped with broken crackers. There are as many types of chowder as there are soup, though a true chowder is more like a stew than a soup. Some purists would rather eat slugs than a chowder with tomatoes in it or whose name references New York. 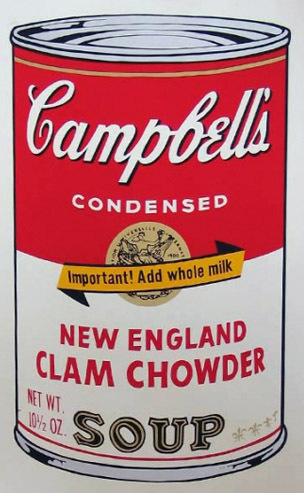 But all chowders must feature the following: broth, salt pork, biscuit and seafood. Aside from that, all bets are off. Chow down. Of course a regional dish with this long a history and which leaves this much room for interpretation deserves a history of its own, and so the good people at the University of Massachusetts, Amherst created the New England Chowder Compendium, a collection of recipes and ephemera exploring how chowder rose to become a staple of New England cookery. Culled from cookbooks held by the university’s Beatrice McIntosh Cookery Collection, the compendium chronicles chowder recipes from the 1700s to the 1970s, through lean times and fat, through recipes heavy with cream and without. And so, as readers click through featured chowder recipes from the 1920s on through to the 1940s, they’re sure to notice the ways ingredients vary. Use evaporated milk and a little water, if cream is not available. Housewives were wise in the 1940s to be thrifty while making fresh stock from knuckles: Save that fat that rose to the top and sell it to your meat dealer. Chowder may be one of the poster food for people who are making do. Don’t have fresh seafood? Canned tuna will do. Lima beans soaked overnight can substitute for clams. The archivists include a nice primer, tracing the development of chowder (the word comes from French for “cauldron”). One recipe that doesn’t sound so good: diet chowder from the 1970s. Kate Rix writes about digital media and education. Read more of her work at katerixwriter.com and at thenifty.blogspot.com.